We are already past the middle of March 2017, which means we are only 9 weeks away from our first Eastern Canadian 2.4 Meter regatta, the Ice Breaker at National Yacht Club in Toronto. The fleet in Victoria, which doesn’t have the same hard water problems the rest of us do, have been racing once per week out of Royal Victoria YC. Summer and early autumn 2017 has a number of interesting regattas scheduled. I have already made contact with the International 12 Meter class who will be participating in Meter Fest with us at the New York Yacht Club in Newport June 9 -11. They are excited we are participating and it will be an excellent opportunity to showcase our boat with the goal of getting a fleet of boats established in Newport. Ten days after Meter fest will be the Clagett Regatta, also in Newport so a number of us are planning to leave our boats at Sail Newport and return for the Clagett. We are anticipating twenty or more 2.4mR’s for Meter Fest. 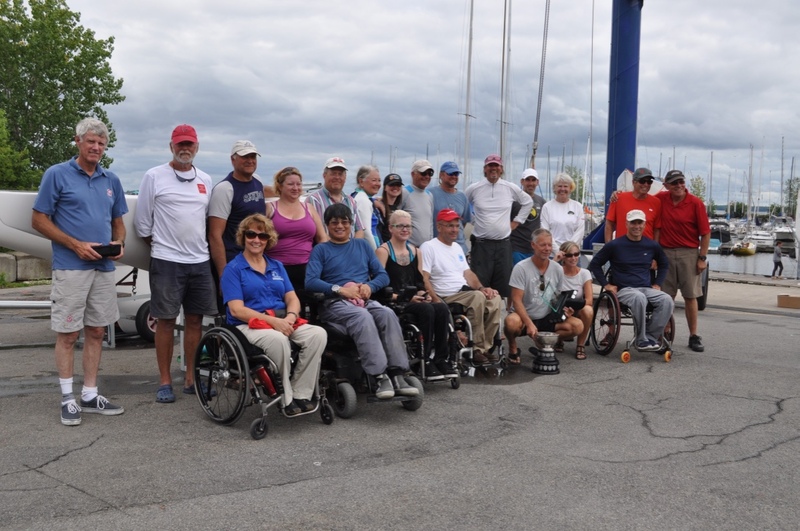 The inclusion of the 2.4 meter class in the 2017 Canada Games in Gimli Manitoba is important because it puts the class in front of our ten provincial sailing associations. While entry is restricted to one per province and there are both age and classification requirements the inclusion has resulted in boat ownership in eight of our ten provinces with very healthy activity in Saskatchewan. 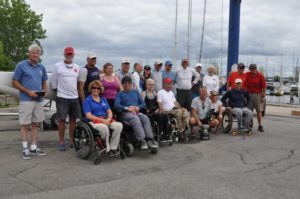 This year is Canada’s turn to host the 2.4mR North Americans and Alain Dubuc and the crew of the Pointe Claire Yacht Club are already working hard to make sure it will be a memorable regatta. Last year they organized the successful Canadian 2.4mR Championships so they have most of their team back for 2017. 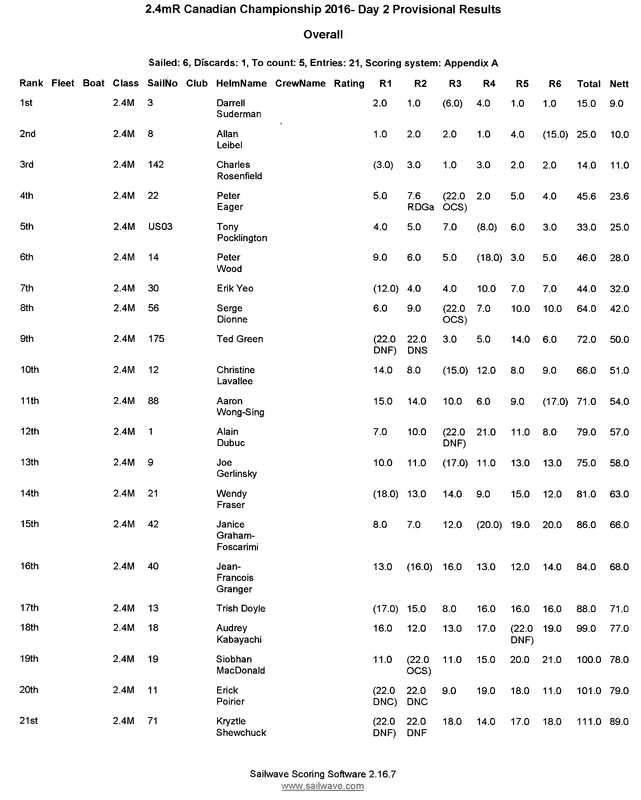 The 2.4mR regatta schedule (found on this website) has a direct link into the Notice of Race for this event. Class Membership dues for 2017 are $50.00. The easiest way to pay your dues are to go to the website and fill out a Membership Form. Dues can then be paid via Paypal, our secure payment processor. If you feel uncomfortable using Paypal, please contact Audrey and she will give you instructions on paying by cheque. What do class fees cover? The 2016-2017 2.4mR CAN AM commenced with three regattas on the Gulf Coast of Florida in December 2016. 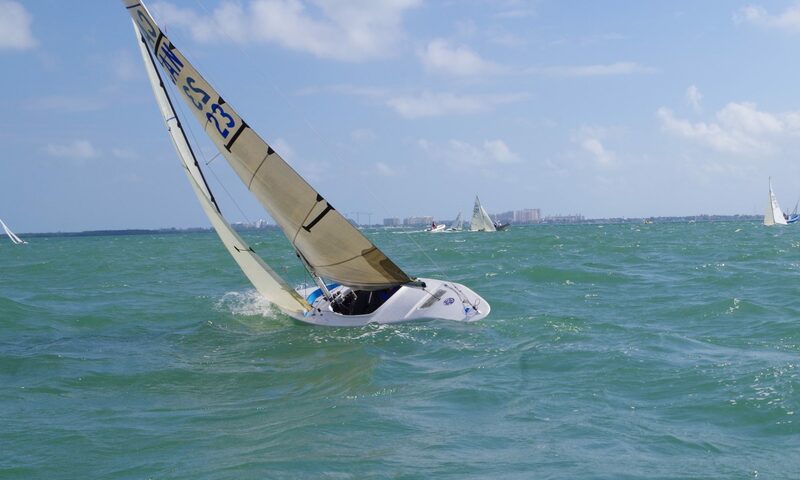 The First Regatta (The America’s Regatta) was held December 2 – 4 at the St Petersburg Sailing Centre in Saint Petersburg FL. 15 boats competed with Dee Smith from Annapolis MD 1st place, Peter Wood from Ottawa, ON second and Tony Pocklington from Fort Myers FL third. Winds were medium to light. 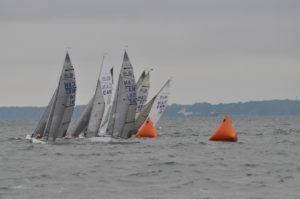 After using Monday December 5th to move the boats to Charlotte Harbour YC the second Regatta (the 2016 North American Championship) was held December 6-7. 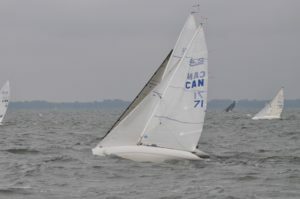 Tuesday saw winds of 10 to 13 knots with Allan Leibel of Toronto winning two races and Dee Smith of Annapolis winning the other. On the second day Dee won the first race of the day with Alan in close pursuit in second. The second race saw Allan get around the windward mark first while the rest of the fleet was becalmed and trying to sail against an unfavourable tide to the windward mark. After 20 minutes the RC abandoned racing for the day with the result that Dee became the 2016 North American 2.4mR champion. The 2016 United States 2.4mR championships were the final regatta of the December series. Four races were held on Thursday December 8, with three races on December 9th and the final two races on December 10th. Allan Leibel definitely dominated the series winning all nine races. Charles Rosenfield placed second and as the top resident US sailors was award the 2016 US 2.4 Meter Championship. Races on all days were sailed in a 10 to 15 knot wind range. Although a cold front swept through the area on December 9th and 10th it was still comfortable sailing for the northerners. As many of us contemplate finishing our 2016 summer season and are either putting our boats away or planning for the long migration to Florida, for the winter 2.4mR season, I would like to reflect on the season past and what we have to look forward to starting December 2016. Class membership: I am proud to say we have 27 paid up boat owning members in 2016. Our membership base stretches from Cape Breton Island NS to Victoria BC making us one of the most diverse one design classes in Canada. We have boat owning members in eight of Canada’s ten provinces, a claim few other classes can match. We have solid numbers and active fleets of 5 or more boats in Victoria, Saskatchewan, Toronto and Ottawa. Interest in the class is strong, our problem is finding good quality used boats for new entrants into the class. 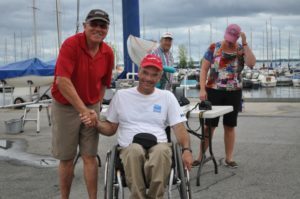 2016 Canadian Championship: We had 22 Boats at the 2016 Canadian 2.4mR Championship with competitors from Alberta, Saskatchewan, Ontario, Quebec, and Nova Scotia. Our host club Pointe Claire Yacht Club and our regatta chair Alain Dubuc did such a great job they will be hosting the 2017 North American Championships. Class Finances: The class finances are in good shape. We have paid our 2016 class dues to Sail Canada and to the International 2.4mR Class Association. We had a healthy discussion on class finances at the AGM in Pointe Claire and have decided to reduce the annual membership fee to $ 50.00 per boat owner for 2017. We also decided that class membership will not be required for non boat owners participating in the occasional regatta. We will be purchasing sail stickers for measurement requirements and distributing them free of charge to Canadian sailmakers. In 2017 we wish to increase the awareness of the class within the Canadian sailing community. For this we will allocate a small promotional budget. 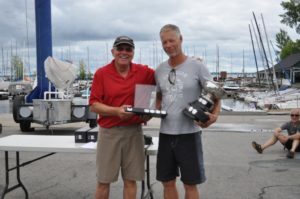 Darrell Suderman of National Yacht Club, Toronto won the 2016 Canadian 2.4mR Championship in a hotly contested fleet of 21 boats edging out Allan Leibel of Toronto by one point and Charlie Rosenfield of Woodstock CT by two points in the six race series. 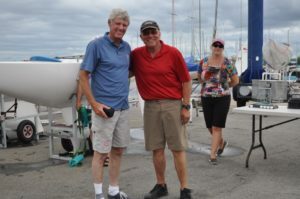 Racing on Friday August 12, was held in 14 to 16 knot North easterly winds and grey clouds as Suderman and Leibel each took a first and a second in the two races run with Rosenfield barking at their heals with two third place finishes. Saturday August 13th saw lighter winds in the 8 to 12 knot range with Rosenfield having the more consistent record of a one first, two seconds and a third. However Suderman won the final two races to hold onto first place while Leibel was able to discard a fifteenth to hold second. The 2016 Canadian Championship had entrants from as far away as Calgary, Alberta, Cape Breton, Nova Scotia and Fort Myers, Florida and speaks well for the health of the class in Canada which is enjoying its largest class membership.